(Reuters) - Three of Whitney Houston's best known singles soared back into Britain's top 40 pop chart Sunday following her death in a California hotel room. Houston's version of the Dolly Parton ballad "I Will Always Love You" entered the weekly rundown at number 14, while "I Wanna Dance with Somebody" was in 20th place. "One Moment in Time," a song Houston recorded for the 1988 Olympics in South Korea, was a new entry at number 40, according to the Official Charts Company, which compiles the list. A collection of Houston's greatest hits entered the album chart at number seven. Houston was found dead in a hotel in Beverly Hills on Saturday, February 11. The cause of death has yet to be determined. 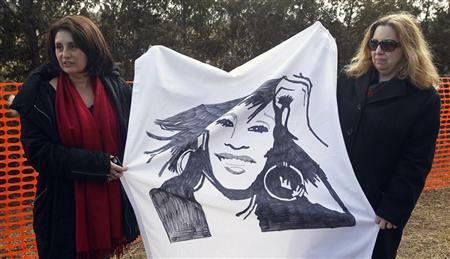 Her funeral service was held Saturday in Newark, New Jersey. The chart's compiler said earlier in the week that 27 of her singles had climbed into the top 200. The deaths of Michael Jackson and Amy Winehouse led to similar dramatic increases in record sales. The number one spot on the UK singles chart was claimed by English producer DJ Fresh with his new single "Hot Right Now."